Live recordings in Real Audio(tm) Format. Live recordings in MP3 Format. Traditionally, to ensure a good apple crop, wassails are held in cider orchards. A local ceremony is held on "twelfth night" – January 6th (Epiphany, also known as old Christmas Day). 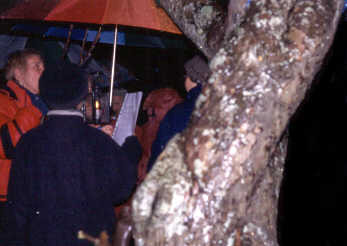 In spite of very heavy rain, people gathered around a token cider apple tree in the orchard to celebrate the previous crop and "drive out evil influences." There was singing, ceremonies, and dancing. Wassailing the Cider Apple Tree. Click here to download a free Real Audio(tm) Player. Note: The rain was very heavy, and the recording tape was later damaged. The Circle Dance was recorded by a dancer circling the tree and musicians, so the sound changes as the dancers move around the circle. Click the links below to hear these extracts of wassails in Real Audio Format. Gathering for the Wassail – Real Audio. The Dartmoor Wassail – Real Audio. Apple Round Song – Real Audio. Wassail Medley – Real Audio. Anointing the Tree – Real Audio. Traditional Circle Dance – Real Audio. Click the links below to hear these extracts of wassails in MP3 Format. (Most versions of Microsoft Windows Media Player(tm) can play this format.) Note. At present, the Real Audio files are better quality. Gathering for the Wassail – MP3. The Dartmoor Wassail – MP3. Apple Round Song – MP3. Anointing the Tree – MP3. Traditional Circle Dance – MP3.